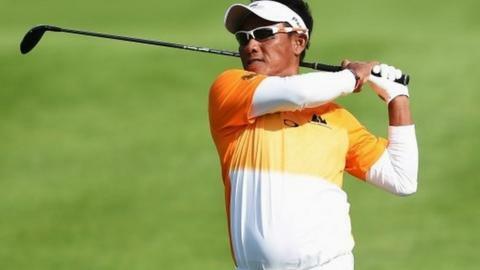 Thailand's Thongchai Jaidee saw off the challenge of Englishman Graeme Storm to win the European Open in Germany. Jaidee held his nerve on the final hole to sink an eight-foot putt to win by one shot at Golf Resort Bad Griesbach. The 45-year-old carded a bogey-free 67 to finish 17 under and secure his seventh European Tour title. Storm, seeking his second victory, was runner-up, with compatriot Ross Fisher and Welshman Jamie Donaldson among those in joint fifth. Jaidee needed a par four at the last to seal victory and managed to get up and down despite a wayward approach.